When Italian flair and South African ingenuity come together, great innovations and technology usually follow. 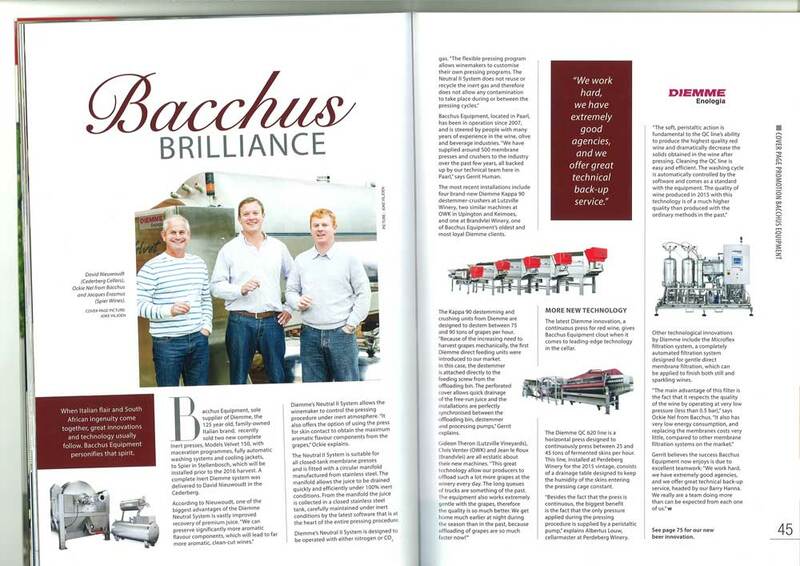 Bacchus Equipment personifies that spirit. Bacchus Equipment, sole supplier of DIEMME, the 125 year old, family-owned Italian brand, recently sold two new complete Inert presses, Models Velvet 150, with maceration programs, fully automatic washing systems and cooling jackets, to Spier in Stellebosch, which will be installed prior to the 2016 harvest. A complete Inert Diemme system was delivered to David Nieuwoudt in the Cederberg. According to Nieuwoudt, one of the biggest advantages of the Diemme Neutral System is vastly improved recovery of premium juice. “We can preserve significantly more aromatic flavor components, which will lead to far more aromatic, clean-cut wines”. Diemme’s Neutral II System allows the winemaker to control the pressing procedure under inert atmosphere. “It also offers the option of using the press for skin contact to obtain the maximum aromatic flavour components from the grapes”, Ockie explains. The Neutral II System is suitable for all closed-tank membrane presses and is fitted with a circular manifold manufactured from stainless steel. The manifold allows the juice to be drained quickly and efficiently under 100% inert conditions. From the manifold the juice is collected in a closed stainless steel tank, carefully maintained under inert conditions by the latest software that is at the heart of the entire pressing procedure. 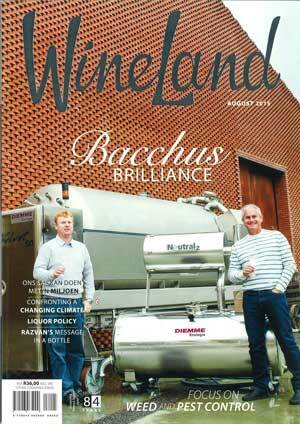 Bacchus Equipment, located in Paarl, has been in operation since 2007, and is steered by people with many years of experience in the wine, olive and beverage industries. “We have supplied around 500 membrane presses and crushers to the industry over the past few years, all backed up by our technical team here in Paarl,” says Gerrit Human. The most recent installations include four brand-new Diemme Kappa 90 destemmer-crushers at Lutzville Winery, two similar machines at OWK in Upington and Keimoes, and one at Brandvlei Winery, one of Bacchus Equipment’s oldest and most loyal Diemme clients. The Kappa 90 destemming and crushing units from Diemme are designed to destem between 75 and 90 tons of grapes per hour. “Because of the increasing need to harvest grapes mechanically, the first Diemme direct feeding units were introduced to our market. In this case, the destemmer is attached directly to the feeding screw from the offloading bin. The perforated cover allows quick drainage of the free-run juice and the installations are perfectly synchronized between the offloading bin, destemmer and processing pumps” Gerrit explains. The latest Diemme innovation, a continuous press for red wine, gives Bacchus Equipment clout when it comes to leading-edge technology in the cellar. The Diemme QC 620 line is a horizontal press designed to continuously press between 25 and 45 tons of fermented skins per hour. This line, installed at Perdeberg Winery for the 2015 vintage, consists of a drainage table designed to keep the humidity of the skins entering the pressing cage constant. “Besides the fact that the press is continuous, the biggest benefit is the fact that the only pressure applied during the pressing procedure is supplied by a peristaltic pump” explains Albertus Louw, cellarmaster at Pederberg Winery. “The soft, peristaltic action is fundamental to the QC line’s ability to produce the highest quality red wine and dramatically decrease the solids obtained in the wine after pressing. Cleaning the QC line is easy and efficient. The washing cycle is automatically controlled by the software and comes as a standard with the equipment. The quality of wine produced in 2015 with this technology is of a much higher quality than produced with the ordinary methods in the past”. Other technological innovations by Diemme include the MicroFlex filtration system, a completely automated filtration system designed for gentle direct membrane filtration, which can be applied to finish both still and sparkling wines.